Vascular smooth muscle cell (VSMC) apoptosis plays an important role in vascular remodeling and atherosclerotic plaque instability. Oxidative stress in diseased vessels promotes VSMC apoptosis in part by activating the c-Jun N-terminal kinase (JNK) pathway, which has been identified as a molecular target of miR-92a in macrophages. Here, we examined the expression and biological activity of miR-92a in VSMC. Quiescent VSMC exhibited a low basal expression of miR-92a, which was positively regulated by serum stimulation and negatively regulated by H2O2. 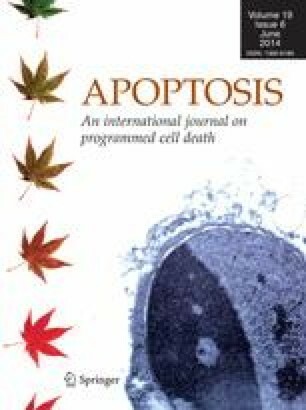 Overexpression of miR-92a decreased H2O2-induced VSMC apoptosis as indicated by TUNEL assay and cleaved caspase-3 protein levels. Using 3′UTR-reporter assay, we found that miR-92a overexpression led to suppression of both mitogen-activated protein kinase kinase 4 (MKK4)- and JNK1-dependent luciferase activity. We also found that 10 mer seed match between miRNA:mRNA pair is more efficient than 8 mer seed match for us to identify authentic miRNA target. Protein levels of active phospho-JNK and phospho-c-Jun, downstream targets of the MKK4–JNK1 pathway, were also decreased by overexpressing miR-92a in VSMC under oxidative stress. Consistent with these findings, overexpression of MKK4 reversed the anti-apoptotic effects of miR-92a in oxidatively stressed VSMC. In conclusion, miR-92a overexpression inhibits H2O2-induced VSMC apoptosis by directly targeting the MKK4–JNK1 pathway. The online version of this article (doi: 10.1007/s10495-014-0987-y) contains supplementary material, which is available to authorized users. This work was supported by the American Heart Association Beginning Grant-in-Aid 0765094Y (to Y.T. ); NIH Grant HL086555 (to Y.T. ), and NIH Grants HL076684 and HL62984 (to N.L.W. ).